Does your leadership create a culture of exile? Engineers at prototyping specialist Protomold are often asked, "How can I get my parts made for less money?" If you can build in some flexibility in your design constraints, there are many ways to save. Protomold's Gus Breiland lays it all out for you. BASF has created the world's first expanded thermoplastic polyurethane (E-TPU), which it is marketing under the name Infinergy. The first product making use of this entirely new, closed-cell particle foam went on the market recently in the "Energy Boost" running shoe from adidas, which the sportswear manufacturer has developed in close partnership with BASF. But this material can be used for a lot more than just running shoes. The Georgia Tech Research Institute is developing a new generation of advanced radio frequency (RF) jammer technology. The project, known as Angry Kitten, is utilizing commercial electronics, custom hardware development, novel machine-learning software, and a unique test bed to evaluate unprecedented levels of adaptability in electronic warfare technology. The GE90 is already the largest and most powerful jet engine ever built. But that doesn't mean that GE engineers have stopped trying to make it bigger, better, and leaner. The new 3Dconnexion SpaceMouse Wireless provides precise 3D navigation in a sleek, wireless design. This new tool combines 3Dconnexion's 6-degrees-of-freedom (6DoF) sensor with 2.4-GHz wireless technology to deliver the reliability of a wired device without the clutter of cords. Gently manipulate the SpaceMouse Wireless' controller cap to simultaneously pan, zoom, and rotate digital models or viewports. You should get about a month's use out of the unit's lithium-ion battery before recharging. Initially inspired by components he got from Radio Shack, Mike Snijders designed a game-changing tattoo machine that marries the nuanced performance of the dual-coil design with the ease of use, minimal maintenance, and long lifetime of DC motors. Texas Instruments has introduced a new family of four digital-input, closed-loop I2S amplifiers for mid-power stereo audio applications including TVs, soundbars, portable docking stations, Bluetooth speakers, and aftermarket automotive audio products. The TAS5760xx devices feature high switching frequency, allowing designers to use smaller output filter components to reduce overall solution size and bill of materials (BOM) cost. They stream 20-W continuous power per channel without a heatsink and deliver the industry's best performance specifications, including THD+N of 0.03 percent at 1 W, crosstalk of -92 dB, and 66-uV idle channel noise. Stock Drive Products now carries all former Techno, Inc. stock of Acme lead screws and nuts. The lead screw selection is vast, with many different diameters, lengths, and number of starts available, as well as left-hand threads for certain sizes. The nuts come in several different materials and styles, including anti-backlash, ensuring that every linear motion application can be fitted with just right part. All SDP Acme lead screws are made of high-quality 300 series stainless steel and offer excellent corrosion resistance. 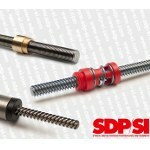 At the SDP eStore, look for Ball & Lead Screws->Lead Screws->Acme Lead Screws. 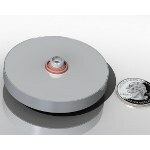 New Scale Technologies has demonstrated a miniature rotary actuator module (M3-R) with torque of 0.17 Nm and speeds of more than 400 degrees per second in a compact, 60-mm-diameter by 8-mm-thick design. Resulting from the successful completion of a Phase 1 SBIR project for the U.S. Navy, the non-inductive rotary actuator module delivers higher power output in a smaller footprint than electromagnetic pancake motors or other piezoelectric actuators. Applications include guided munitions and missile systems, MRI-compatible medical devices, unmanned aerial vehicle (UAV) controls, gimbal systems, and computer equipment. Improvements to the MapleSim 6.2 interface give engineers the ability to create models faster than ever before. With new ways to connect components, enhanced line routing that combines improved automatic layout with finer manual control, and more easily managed parameter lists, high-frequency tasks are done more quickly and easily. New and improved add-ons include advanced hydraulics and enhanced toolchain connectivity. 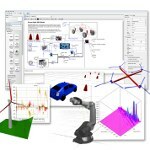 The connectors for Simulink, JMAG-RT, VI-CarRealTime, B&R Automation Studio, and FMI were all enhanced with this release. Oshkosh Defense, Lockheed Martin, and AM General are going head to head in the Army's full-scope testing of the Joint Light Tactical Vehicle (JLTV) prototypes. Each of the three vendors delivered 22 vehicles and six trailers for testing to three sites: Aberdeen Proving Ground, Md. ; Yuma, Ariz.; and Redstone Arsenal, Ala. In this age of advanced technology, how hard could it be to develop a robotic bird that flies by flapping its wings? Despite the apparent simplicity of the idea, it's very hard -- if you want the bird to actually fly. And how hard could it be to make a robot bird whose wings can flap independently of each other? So hard that this breakthrough has been out of reach for engineers -- until now. Belonging to "the tribe" is a human need we never grow out of -- yet Christine Comaford says most leaders neglect it in the workplace. "Many companies have fostered cultures of exile," says Comaford, author of the New York Times best seller "SmartTribes: How Teams Become Brilliant Together." "No one is purposely making people feel they don't belong, but they're also not proactively making them feel they do -- and that's a huge, huge mistake." Artec scanners are used by Hyundai Motor Europe engineers to measure and compare prototype seats to meet comfort, ergonomic, shape, and contour quality. The Artec L scanner is used to create the "big-picture" 3D model of the car seat. The smaller, intricate details of a seat are scanned with the Artec MHT scanner. Then all the data is combined to make a complete, highly precise 3D model of the car seat that is ready for further refinement. What's a Mebotics Microfactory? Well if you are the four guys who have dreamed up and built the device, it's a 3D printer and CNC milling machine all in one. Made "by makers for makers," the Microfactory is described as a networked, easy-to-operate, affordable, mess-free, quiet, and safe desktop machine capable of printing functional parts in four colors or multiple materials and computerized etching and computer-controlled milling. It's a Kickstarter project, and if it has any real legs, well, you be the judge.